Cross your fingers and make a wish for . . . The Vintage Village Lucky 13 Fair! An impressive list, and no mistake. Any of your favourites in there? And if that wasn't enough, there were some world-changing inventions in 1913 too, including the bra, the parachute, the crossword puzzle, the modern x-ray tube and Brillo pads! I wonder what marvels 2013 will bring? - that's an awfully hard act to follow. Anyway, we'll do our best to make a great start to 2013 with our Lucky 13 Fair! On Sunday 13th we can promise you lucky people a cheery host of excellent, top quality traders bringing you oodles of authentic vintage clothing and accessories for ladies and gentlemen, jewellery, homeware, furniture, decorative items, luggage, collectables and curiosities, and locally handmade crafts with a vintage flavour. ★ Pretty Nostalgic magazine will be in attendance for the first time, with a stall attended by our Finder of the Fair for August 2012, Samantha Young (who also happens to be the regional editor for this fine periodical). You will be able to purchase copies of the new and previous issues and make fantastic savings on subscriptions! You will also receive a free back issue and gorgeous greeting card with your subscription too!! ★ TinTrunk will be having a Red Dot January Sale! All items marked with a red dot are HALF PRICE. Plus a £1 Crazy Bargain Rummage Box. ★ All Mod Cons will be in their usual spot for the last time! They have just moved into a unit at Room at the Top Vintage Goods, but they will be in the market hall too, ready to meet their regular customers and let them know about their fab new sales lounge. ★ All Our Yesterdays is having a Grand New Year Sale! Don't forget to saunter over the Market Place to Room at the Top Vintage Goods too, where you'll find lots more vintage goodness awaiting you. Honestly, what more do you need to cheer up a dreary old January weekend?! Well, maybe a little refreshment to keep you going. As usual, we have the finest mobile coffee purveyors in the North West, Kandoo Coffee. There's the incomparable Stuart Thornley Cake Design and his wondrous cake creations (menu below). And we're thrilled to announce that the fabulous Lord of the Pies will be back (menu just in - see below), with their handmade, award-winning gourmet British pies made from locally sourced ingredients. UPDATE! 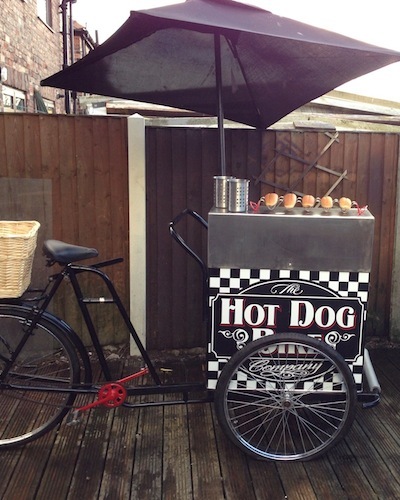 We will be welcoming The Hot Dog Bike Company for the first time, vending their hotdogs, and bacon or sausage barms, from an original 1920s vendor's bicycle. Check the photo below for a preview of their magnificent bike. If you would like to reserve anything let us know! Slow Braised Cheshire Lamb, Red Wine Jus, hint of Mint and Broad Beans. The Stockport Pie: Cheshire ground beef, local grown veg and Robinson's Old Tom ale. Cheshire Smoked Chicken and Ham with soft Herb Sauce. Best of British Mixed Cheese and White Wine Onions. A full selection of cold pies will also be available to take home. There'll be lots more updates coming up so do check back on the latest developments. All Mod Cons - vintage mid-century homeware, telephones, collectables, ladies' accessories 50s-70s. Now set up as a new trader at Room at the Top Vintage Goods. Don't miss their swanky new sales lounge! BRG Collectables - - vintage collectables (no, really), accessories, militaria. NEW! Bus Stop Vintage - vintage women's clothing, accessories and jewellery, 1920s-80s. Dabberdecades - simply the best 1960s vintage clothing, accessories, homeware and collectables. Edwina Worswick - vintage homeware and decorative items. Fiona Barber - vintage clothing, homeware, records; hand crafted jewellery. NEW! Funky Koval - vintage Eastern European homeware. Garbo Antiques - the mighty Garbo returns! With an overwhelming choice of vintage men's and women's clothing, accessories, costume jewellery and more. Hotch Potch Vintage - women's and men's vintage clothing 30s-80s, hats, accessories, costume jewellery, homeware, books. 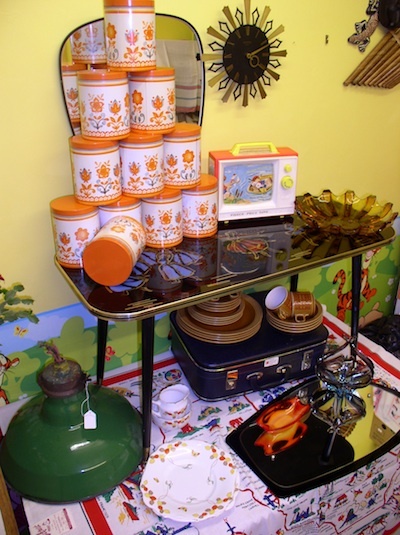 Levy Delights - vintage homeware with an emphasis on dining. NEW! Leyla Temiz - vintage clothing and homeware, 1960s-80s. Lost But Never Forgotten - vintage clothing, accessories, homeware 60s-80s, craft accessories. NEW! Lotties Lotts Vintage - vintage women's clothing and accessories. Maureen Woodman - glassware, pottery, embroidery and lace, old books. Nice Pontoffles - vintage clothing and accessories, homeware, textiles, collectables, books 40s-70s. NEW! Pearl & Bone - vintage women's clothing, accessories and jewellery 40s-80s. Peggy Mae Vintage - vintage women's and mens clothing, accessories and jewellery 1950s-1980s. NEW! Penny Lane - vintage men's and women's clothing and accessories, and some vinyl too. NEW! Planet Vintage Girl - vintage homeware and jewellery from one of Manchester's premier, and longest established, traders in quality vintage goods. Populuxe - vintage homeware, clothing, jewellery, collectables. Waiting to welcome you at Room at the Top Vintage Goods. NEW! Pretty Nostalgic - the independent British vintage lifestyle magazine is coming to The Vintage Village! Random Quirks/Toast Rack - vintage clothing, jewellery and accessories; handmade kitsch plastic jewellery 80s style. The luminous Vivien Leigh on the set of Gone With the Wind. She was born in 1913. Source. 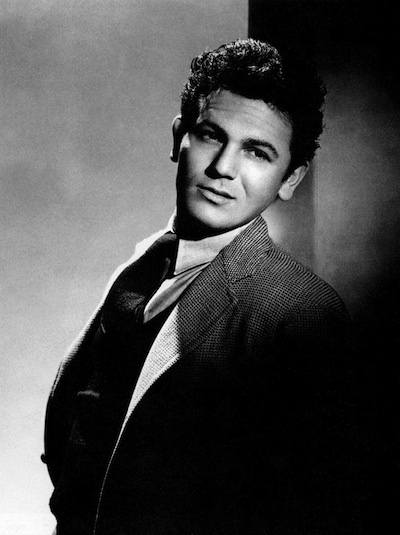 Rebellious working-class bad boy John Garfield. He was born in 1913. Source. 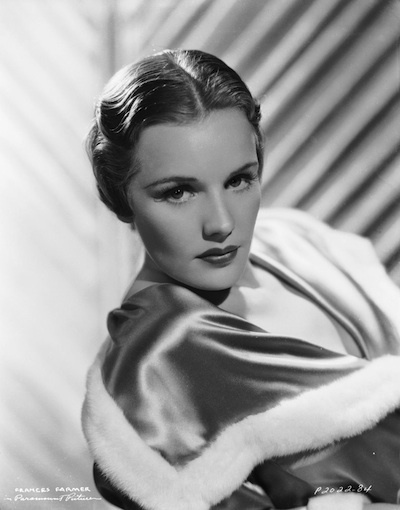 Beautiful and troubled Frances Farmer. She was born in 1913. Source. 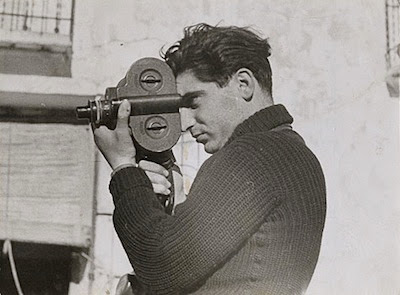 War photographer Robert Capa. Born in 1913. Source. Some of the new items All Our Yesterdays will be bringing to The Lucky 13 Fair. The Hot Dog Bike Company, making their VV debut at the Lucky 13 Fair. Show Us Your Threads - women's vintage clothing and accessories. Snygg - vintage ceramics, glass, various mid-century desirables 50s-70s. Stuart Thornley Cake Design - cake supremo, artiste of icing sugar. Details of this month's specials coming soon. Suzylovesmilo - handmade clothing, accessories and homeware; vintage women's clothing and accessories, mostly 70s-80s, tea sets and china from the 60s-70s. Vintage Belle - genuine vintage women's clothing and accessories, some homeware. And lots of SALE stock this month! Vintage Emporium Ltd. - the vintage queen from York makes a very welcome return to VV with an impeccable selection of prime vintage clothing and homeware. Viv's Vintage - vintage furniture, homeware, glass, ceramics, and a few choice clothing items. Wax Delerium - vintage vinyl and bits and bobs.